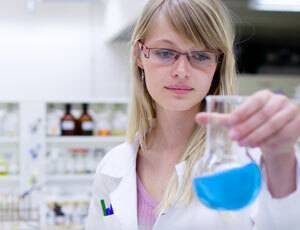 Are you looking for tuition relief through scholarships for chemistry majors? Since the scientific fields are always seeking more innovative professionals to recruit into high-demand positions, scholarships are abundant nationwide for students majoring in science, technology, engineering, and mathematics (STEM) fields, including chemistry. While many chemistry majors are aiming for research careers to spend most of their times conducting experiments in laboratories, some graduates decide to pair their knowledge of chemistry with other skills to become physicians, pharmacists, engineers, educators, and other scientists. In order to help finance your professional goals, read on to learn more about 25 great scholarships that are available specifically for declared chemistry majors. At Towson University, two Alan and Eileen Wingrove Chemistry Scholarships are granted annually for $1,000 by the Chemistry Department to outstanding undergraduate students with sophomore, junior, or senior status who have declared a major in chemistry or forensic chemistry. Qualified applicants must have completed at least 13 credits in chemistry, possess a minimum cumulative GPA of 3.0 or higher, and submit a one-page essay on career interests. Annually, the American Chemical Society Scholars Program provides $5,000 renewable awards to African American, Hispanic, and American Indian students nationwide who are majoring in chemistry, biochemistry, chemical engineering, or chemical technology. Eligible candidates must be U.S. citizens, be enrolled full-time in an accredited institution, demonstrate financial need, have a minimum cumulative GPA of 3.0, and be planning a career in chemical sciences. In order to ensure future generations of skilled employees for the laboratory testing community, the American Council of Independent Laboratories (ACIL) offers a scholarship for up to $4,000 to encourage students to study the physical sciences, including physics, chemistry, engineering, geology, biology, and environmental science. Applicants must have attained at least junior-level standing or higher in an accredited four-year bachelor’s degree or graduate program in the U.S. Specifically designed to attract and support chemistry students early in their undergraduate career, the Ben A. Edwards Endowed Scholarship in Chemistry is presented annually to outstanding freshmen or sophomores at the University of Nevada – Reno who are interested in declaring a major in chemistry. Eligible students must be enrolled full-time, have a minimum overall GPA of 3.0 or better, and demonstrate a potential for success in a chemistry career. Through the Nebraska Academy of Sciences, the C. Bertrand and Marian Othmer Schultz Collegiate Scholarship is granted each year for $3,000 to sophomore or junior-level students who have declared a major in the natural sciences, including chemistry, physics, biology, and geology. Eligible candidates must be enrolled at a four-year accredited university in Nebraska, be anticipating a career in a science-related industry, and submit two letters of nomination. In honor of a well-known chemist who pioneered significant research contributions centered on the effect of structure on chemical reactivity, the Charles C. Price Fellowship in Polymer History is offered through the Chemical Heritage Foundation for pre-doctoral scholars who are pursuing research on the history of the chemical sciences and technologies. Preference for the nine-month fellowship with a $26,000 stipend will be granted to chemistry majors who are working on a research project related to the history of polymers. Sponsored by the Electrochemical Society (ECS), the David C. Grahame Award in Physical Electrochemistry is granted for $5,000 biennially to graduate students nationwide who have made outstanding research contributions to the field of physical electrochemistry and/or have published a high-quality research paper in the Journal of the Electrochemical Society. Recipients must be willing to present an award lecture and attend a symposium hosts by the Physical and Analytical Electrochemistry Division. Within the Department of Chemistry at East Tennessee State University (ETSU), the Delmas and Wanda Blevins Dugger Chemistry Scholarship is presented annually for $1,500 to declared undergraduate chemistry majors who reside in Johnson, Carter, Washington, Unicoi, or Sullivan counties of Tennessee. Qualified candidates must have completed a minimum of two semesters, have at least eight credits in general chemistry, possess an overall GPA of 3.0 or higher, and demonstrate financial need for assistance. Established at the College of Charleston, the Edward Emerson Towell Chemistry Scholarship is designed to provide $2,000 each year for a maximum of four years to entering freshmen students who have decided to major in chemistry or biochemistry. Eligible applicants must be enrolled on a full-time basis, have an outstanding high school record as evidenced by being in the top 5% in class rank, possess a minimum SAT score of 1200 or higher, and exhibit a strong interest in science with related extra-curricular activities. For full-time students who have completed a minimum of 60 credit hours to achieve junior or senior-level status, the University of Michigan – Flint offers the Fleming A. and Marian E. Barbour Scholarship Fund for $1,300 to those pursuing a Bachelor of Science (B.S.) in Chemistry, Environmental Chemistry, or Biochemistry. Qualified students must have a minimum of 10 credit hours in chemistry coursework, attain a cumulative GPA of 3.5 or higher, and submit a detailed letter of recommendation from one faculty member. As the national honor society for women in chemistry, Iota Sigma Pi awards the Gladys Anderson Emerson Annual Scholarship for $2,000 each year to extraordinary female junior and senior-level undergraduate students who have excelled in a chemistry or biochemistry curriculum at an accredited U.S. institution. Applicants must submit an official transcript, two-page personal statement on career goals in chemistry, and three letters of recommendation. Well-known for being the world’s leading pharmaceutical research company, GlaxoSmithKline presents the Science Achievement Scholarship annually for $3,000 to U.S. citizens who graduated from a UNCF-member institution and are currently attending a graduate degree program. Qualified applicants must maintain a minimum cumulative GPA of 3.0 or better in pursuit of a degree in organic chemistry, analytical chemistry, pharmacology, molecular genetics, microbiology, molecular biology, chemistry, or biochemistry. Administered through the American Chemical Society (ACS), the Hach Second Career Chemistry Teacher Scholarship provides up to $6,000 annually to chemistry professionals who are pursuing a master’s degree in education with the goal of becoming certified to teach chemistry or other sciences. Candidates must have a bachelor’s or higher degree in chemistry, have at least one year experience working in a chemistry-related field, and be U.S. citizens. Within the Poise Foundation, the Hubertus W.V. Willems Scholarship for Male Students is awarded annually for up to $3,000 to men who are attending an accredited institution in the United States with a declared major in engineering, chemistry, physics, or mathematical sciences. Applicants must be participating members of the NAACP, demonstrate financial need, be enrolled on a full-time basis, and possess a minimum cumulative GPA of 3.0 or better. Annually, the Society of Flavor Chemists bestow the Jogue Inc. Memorial Graduate Scholarship Award for $2,000 to one outstanding student who is pursuing a graduate degree in one of the allied disciplines of the flavor industry, including chemistry, biology, marketing, nutrition, food science, microbiology, and engineering. Along with the application, candidates should attach an official transcript, list of extra-curricular activities, letter of recommendation, and a personal statement on career goals in the flavor business. Through the American Association of Candy Technologists (AACT), the John Kitt Memorial Scholarship Fund presents $5,000 annually to college sophomores, juniors, and seniors who are majoring in food science, chemistry, biology, or other related areas to pursue a career in the confectionery technology. Applicants must be attending a four-year university within North America, have a minimum GPA of 3.0 or greater, and have related work/research experience. Within the Texas State University system, the Lois Ann Cofer-Monzingo Scholarship in Chemistry is awarded annually for $4,500 to incoming freshmen who have declared a major in chemistry or biochemistry for enrollment as a full-time undergraduate student. Qualified candidates should be in the top 25% of their high school graduating class, maintain a minimum cumulative GPA of 3.0 or higher, and provide a brief statement on interests in chemical science. At Frostburg State University, the Masser Family Chemistry and Healthcare Scholarship is granted each year for up to $2,000 to a deserving student enrolled full-time in the undergraduate chemistry program with the intent to pursue graduate education leading to a career in medicine, pharmacy, or other healthcare fields. Eligible candidates must have junior or senior-level status, have an overall GPA of 3.0 or higher, and be actively involved in the department’s extra-curricular activities and/or organizations. Established by the Sons of Norway Foundation (SOFN) in memory of a remarkable aerospace engineer/chemist at NASA who died unexpectedly at the youthful age of 35, the Nancy Lorraine Jensen Memorial Scholarship is available for female American citizens between the ages of 17 and 35 who are enrolling in undergraduate studies for chemistry, physics, or chemical and mechanical engineering. Applicants must be the daughters or granddaughters of current members, be enrolled full-time, and have attained an SAT score of 1800 or greater. Sponsored by the American Chemical Society (ACS), the Priscilla Carney Jones Memorial Scholarship is granted for $2,500 annually to female undergraduate students who have entered their junior or senior years of full-time study in an accredited chemistry degree program at a U.S. institution. Eligible candidates must demonstrate financial need, be U.S. citizens, have completed research or plan to conduct research, and maintain an overall GPA of at least 3.25. At Missouri State University, the Robert S. Christie Memorial Scholarship is typically granted for $1,500 to three or four deserving undergraduate students in the Department of Chemistry who have worked in the chemical stockroom or in the research laboratory. Qualified candidates must be enrolled full-time, have at least junior-level status, be a declared chemistry major, demonstrate financial need, and exhibit potential to pursue graduate studies in chemistry too. For individuals who have expressed an interest in the plastics industry, the Society of Plastics Engineers Foundation offers numerous annual scholarships for up to $6,000 for undergraduate or graduate students who are majoring in plastics engineering, polymer science, chemistry, physics, chemical engineering, mechanical engineering, or industrial engineering at an accredited U.S. institution. Applicants must submit three recommendation letters, a college transcript, a current resume of employment history, and a two-page personal statement. Within the Department of Chemistry and Industrial Hygiene, the University of North Alabama (UNA) offers the Thomas P. Murray Memorial Scholarship Fund for full-time upper-division undergraduate students who are majoring in chemistry, biology, physics, or earth science. In order to qualify for up to $1,500, students must enroll in a chemistry course each semester, have a minimum cumulative GPA of 3.0 or higher, and show potential for future excellence. In honor of the former employee who helped establish the Carbon Club of the Chemistry Department, the William Marshal MacNevin Memorial Scholarship is hosted by the Ohio State University for $1,000 to undergraduate full-time students who have declared a major in chemistry or biochemistry. Recipients will be chosen based on course record, academic performance, professional goals, participation in research, ranking, and financial need. Through the National Society Daughters of the American Revolution (DAR), the William Robert Findley Graduate Chemistry Scholarship is granted for $2,000 annually to a deserving student attending graduate school full-time at an accredited U.S. institution with a declared major in chemistry. Applicants must have a minimum cumulative GPA of 3.25 or higher, have at least one year of graduate studies remaining, and submit a typed statement of career objectives. Whether you are a graduating high school senior just starting out on your college plans or are currently enrolled in an undergraduate or graduate chemistry program, it is important to be aware of the many organizations and universities that have put forth financial aid to help cover the costs of rising tuition prices. Since scientific fields are concerned with attracting bright minds, put your best foot forward by maintaining a high GPA, achieving high test scores, being involved in conducting research projects, and participating in professional extra-curricular activities to have the best chance of landing some of the best scholarships for chemistry majors.